Agenda 2030: "That's our challenge": Visit to F.I.E.R.I. 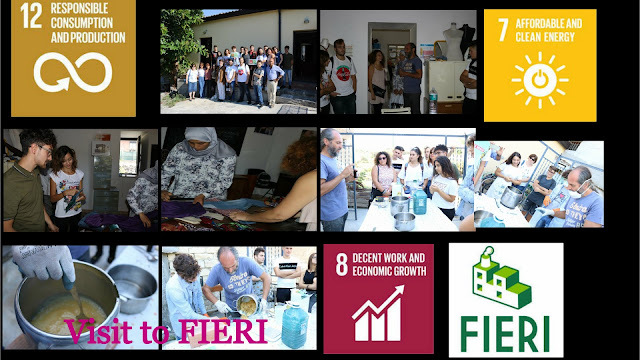 We visited a factory in Catania called F.I.E.R.I. : the intercultural factory of eco-sustainable re-use. It is the first recycling sicilian centre set up by 13 associations and social cooperatives. Mr. D’Amico, the responsible of F.I.E.R.I. , taught us the importance of recycling for the safeguard of the planet.There is an interwave between the artisanal knowledge of local people, and the talents of migrants welcomed in this factory. Migrants follow some workshops, technical and artistic training, local people bring items don’t use no longer and thanks to some volunteers, migrants make something news to be sold. We learnt how to make soap using natural ingredients. We visit the labs and shop of tailors. An Italian volunteer is teaching how to create items used cloth samples. Our students learn how to create new objects from waste materials. The objects are sold in a distributions channel of unconventional economy with a self-produced brand. Everybody is interested in understanding the chemical reactions of all the ingredients to make natural soap.